I like quirky bikes. I love the sustainable power sources (powered by peanut butter toast and coffee), their simplicity (50-60lbs v. 1800 for my Insight), and their small business mentality (Lightfoot or Little Circles are alot smaller than Honda). Thanks to some quick comments yesterday from Mike and Matt there is another bike on my wish list. 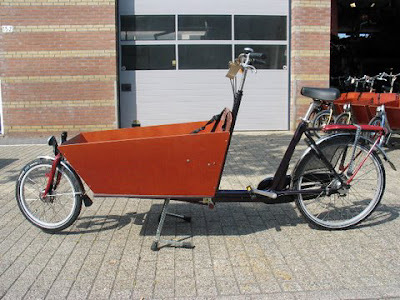 The Bakfiets is a Dutch style”work bike” and is gorgeous. Plus it is packed full of goodies like internal hub gearing, roller brakes and hub generated dynamos for lights. This is one seriously functional cargo bike for the city/rural roads that is spec’d for the long haul. Not sure if I would trust it on a tractor path, but given the engineering visible in the picture I am sure it is more stable than I think. Pricing seems reasonable and their other city bikes are worth a shot too-I am particularly partial to their Secret Service which is dripping with Retro/Functional cool and a nice price. This may not solve the 40 mile commute daydream, but for getting product to market or running to the store the Bakfiets is one sweet ride. This is something I struggle with. I live with a 38 mile round trip commute. There is no public transportation, and car pooling is difficult as each department has staggered start times. While there are beautiful country roads with passable shoulders for biking, there is that whole Winter thing, and the 38 mile daily commute is pretty daunting-even in my MTB racing days of yore. Closer to work housing gets alot more expensive, and with the market this flat it would be difficult to offload a house on the freeway and not lose money. These are the 2 year old arguments that led me to purchase my 2001 Honda Insight 18 months ago. In the summer I can go to work 4 days a week on 2 gallons of gas. Not too shabby! In the Winter it climbs to about 3. But we were running the math this weekend trying to find a way into acreage before I turn 40 and selling the Insight would save about $10k in the next 2 years between payments and insurance. That would knock 1-2 years off the Get Beo a Farm plan. On a random Google trip this weekend I was looking for a Farm Bike. 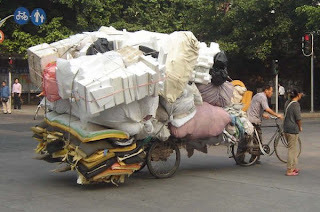 I have this weird fantasy of a very low geared quad Human Powered Vehicle (HPV) with a payload capacity of about 1 cu yd that I could put tools and veggies in and pedal out to the Back 40 with on my farm. I swear I have seen them, but recent searches have come up dry, though if anyone needs it, it is this guy. I did find some really sweet bikes that are pretty close from a small company in Montana called Light Foot Cycles. Their PediTruck is just about perfect, and they also sell one of the most reasonably priced Cargo Trailers for bikes I have ever seen. Spending $4k on a pedal truck for the farm is a joke, but I like looking at quirky bikes-if for no other reason than to re-assert my geekiness. Then I stumbled on the part that makes this a Carbon Neutral Post. with fairing) as long as you have fuel-basically a long distance gasoline/human hybrid that would only add about 30 minutes each way to my commute. They don’t give any economy figures, but with mopeds getting upwards of 100mpg I think this could do up to 500+ if you pedal enough on the uphills-heck the fuel tank is only about 1 cup! But that is still not true carbon neutral. Back to that Honda 4-stroke. Any engine this small is carburated. And anything carburated can run on any alcohol mix you want with relatively little tinkering (ok-it takes alot of tinkering, but no computer hacking so I can do it with enough books, tools, and patience). E-85 is becoming more available, but I am a do it yourselfer, so I want to make my own. I posted in June about the possibility of using my favorite crop, Sunchokes, to make 1600 gallons of ethanol per acre. While I only have about 200 sq ft of Sunchokes, that would still be enough to make about 70 gallons of alcohol (someone check my math)-enough to power my HPV hybrid for about a decade (35,000 miles?!?). Plus if I tune the engine right (and get back inshape), I might hit 30mph average speeds. 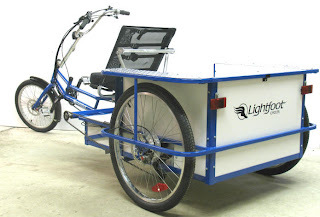 A Light Foot Cycle with the ethanol modified power assist would be about $3k and a weekend or two of sweat equity- I could limp through carpooling in the winter and catch up on my reading. That extra $7k would also make the cold November commutes feel a little warmer. Not sure how serious this is-selling an Insight because it uses too much gas seems extreme, but trading a car in on a bike feels like a step in the right direction. Regardless I think getting past the stigma that some bike commuters have against motor assisted bikes, and learning to start thinking of them as HPV Hybrid’s could open up alot of options for alot of people. After my recent post about burnout I can’t believe I am even considering this, but here it is… I am seriously considering renting acreage. About 7 miles north of our home there is a 20 acre permaculture farmette that was until last year a small CSA/hobby farm. In addition to an orchard, small vineyard, sprawling small fruit stands, timber, and a 5 acre restored prairie, there is also a 1-2 acre garden that was devoted to a CSA. The CSA was run by interns and recent graduates from a local organic farming school, but this year it went without management, and is for the most part fallow. It is this fallow garden I have been musing about ever since the balance sheet of our produce business hit the “black”. Fertile, friable, living soil benefiting form a decade of love from highly trained organic management. Access to a shed full of market gardening accouterments-Glaser wheel hoes, Earthway seeders, and every pruning/harvesting/weeding hand tool you can think of. Water-there is a rain fed 750 gallon water tower on site-all it needs is the drip irrigation to be self sufficient. The Owners have forgotten more about small scale ag than I will learn this decade-and they are on site and like to talk. Poultry: hens, geese, and yes even peacocks, range the land eating slugs and caterpillars while fertilizing as they go. Manure-a team of draft horses and several hogs are in residence. It is 7 miles away-in permaculture speak if your back door is zone 1, this is zone 495. In real speak that means I am not going to be hitting it daily and will likely miss out on pest infestations, etc allowing things to get out of hand in a jiffy. It is 7 miles away so picking tomatoes and lettuce every day is out. And that is our current market. It is 7 miles away-sprout and bird can’t play on the playset while I weed and then go inside for lemonade. It is 7 miles away-that is even less time I am home to tend to our own gardens, housework, kids, reading, i.e. life. I am completely torn, but moving ahead to see if we can make it work. Why in the hell you may ask? My moral imperative (which may be faulty). Here is my reasoning. I have discovered a market in some local restaurants that are craving local heirloom produce, but cannot hit the Madison or Milwaukee farmers markets so they are buying from Sysco. I have the ability to grow market worthy organic produce-at least on a backyard scale. For some reason, Gaia has dropped a 1.5 acre organic garden with a shed full of tools in my lap. The compromise that I am working on is to plant less needy crops than lettuce or tomatoes-ones that are mostly self sufficient (they can out muscle weeds and have little pest pressure) and most importantly-can be harvest in large infrequent chunks. My plant list so far: potatoes, corn, squash, melons, garlic, and others. My second tier (need weeding) list would include: carrots, onions, and herbs like oregano and dill. Third tier that would need at least weekly attention-peppers, cucumbers, etc. I am ruling all the brassicas (broccoli, kale, cauliflower) as I am uncomfortable with bT and the cabbage moths are vicious hereabouts. the trick is to find a market for these crops-I plan on making some calls this weekend after touring the farm. But if I can find a root cellar (the owners may have one) I may just plant enough for our family-we are entirely hooked on home grown potatoes. If we do this the landscaping side our Someday Gardens would have to take a hiatus. Not sure how I feel about that, but I have wanted to be a farmer since I was 10-can’t ever say I wanted to be a landscaper. We try to live our lives by “Being the Change” What would you do? Less than a year ago we posted on the prospect of us providing rain barrels to fill a niche in the market and a service to Mother Earth. That first full trailer of barrels was so exciting! Well, alot can happen in a year-and we’ve come a long way baby! This past Saturday Mia and I unloaded a semi-trailer load of barrels to the ill masked curiosity of the neighborhood. This was a BIG project-these barrels weigh over 100lbs each. Luckily barrels are designed to move easily (their, well, round) so despite having 4.5 tones of oak to handle we had them unloaded in 30 minutes with the help of the drivers and a simple ramp of 2×4’s. We have also made huge improvements in our production-I am on my third drill (an 8amp Bosh Hammer Drill that will try to snap your arms off if you aren’t damn careful-do not ask how I know this) and have upgraded to carbide tipped hole saws and massive auger drills to save time. Mia in her first stab at making the intakes tripled the productivity of that task. So by noon we had the all unloaded, 70 of them in the garage, and 22 built. Of course we can hardly move today, but the accomplishment is impressive. Henry Ford would be proud, and once installed these 22 barrels will account for 40,000 gallons of runoff saved annually-when the batch is completely done by the end of the month it will be closer to 150,000 gallons. Nice. I had know that this was a possibility, but I thought (in my typical arrogant fashion) that I was stronger/better/smarter than the average Joe. I thought that I could balance family life w/ 2 litte ‘uns, working full time, running an expanding small business, standing on 2 municipal committees, running study groups on The Natural Step and volunteering with Sustainability groups and come through grinning. Anyone reading the previous sentence has already concluded that I was deluded in the extreme. Of course I failed, hitting The Wall hard in early July. Basically I couldn’t let my work a day job suffer so instead I disconnected almost completely from the outside world-no cell phone or email for almost 3 weeks until I recharged my mental fuel tank. I missed alot of meetings in my breakdown, and family life suffered as my temper flared and my energy leveled slumped to very low levels. One small bright spot was that I was out of rain barrels so no orders went unfilled. I am back now in some form due mostly to necessity: I have an order for 65 barrels waiting for me. Mia and I unloaded 85 barrels from a semi trailer yesterday morning to the extreme curiosity of the neighbors (“no they are not still full of wine…”). It was satisfying to see the enthusiasm from the ones that I am close enough to that they know what we are up to-with them either driving by with energetic thumbs up, or stopping by to marvel at the display. The kicker is that I am still struggling with saying “No!”. I am doing well by not taking on new tasks, but all the irons we have in the fire are really good ones. The majority of our rain barrels are going to projects to help Milwaukee Co. disconnect their storm water systems from their sanitary sewers. 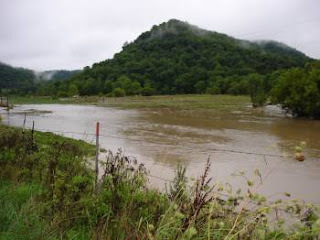 Currently, as a legacy of 19th century city planning, many homes run their gutters into the sanitary sewers-causing massive effluent overflows with extreme water quality and ecosystem ramifications in the Great Lakes. Literally every barrel I build for them helps to alleviate this issue-and there are currently no other sources. How do I say no to that? Same for the municipal committees-we are down to 2-3 voices of “eco-reason” on the Smart Growth committee-bowing out now would all but hand the committee to the opposition giving them the power to write our 25 year plan in their image. The study circles are a great way to build a critical mass of empowered citizens to help in future efforts. Then there is the fiscal side-every dollar we earn on the side business designing and installing landscapes, building rain barrels, or selling produce is one step closer to our Dream House. The business is very lucrative-but also time consuming and stressful which makes it the prime suspect in my burnout. I am more balanced now than I was, but something has to give. My current task load is unsustainable, and I hope and pray to find the strength to level out my commitments to my ability to fulfill them. On a much more pleasant side, I had the intense pleasure of giving several Garden Tours to about a dozen of the local Eco Elite and their encouragement and obvious, vocal approval were an elixir for my soul. Recognition by one’s peers is a wonderful thing. Of course, the tours resulted in several requests for speaking engagements-the cycle goes on! The biggest takeaway is to be selective in Being the Change.